When a good friend of Paul Child passed away suddenly and unexpectedly, his widow asked Paul to finish writing his book in order to keep control over the finished item. As the perfect tribute, Paul set up CQB Publications (UK) Ltd in order to bring the project to fruition. 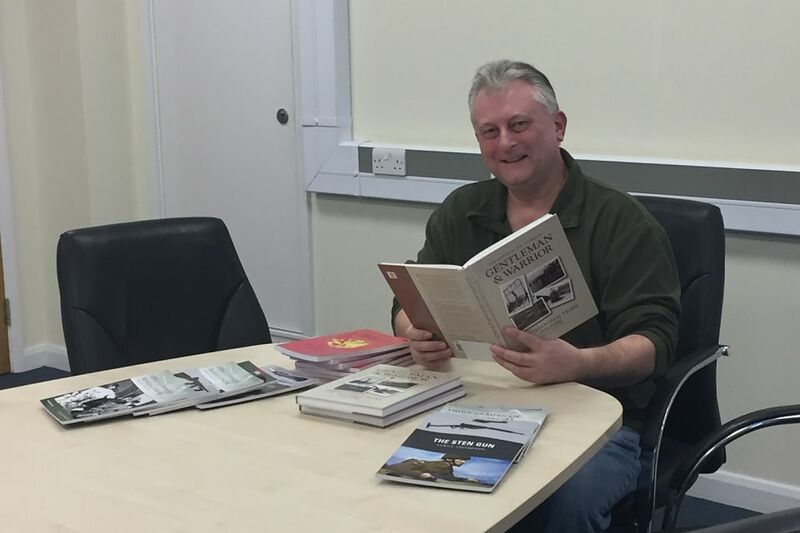 Since then, the business has gone from strength to strength, and Paul has gone onto develop a real passion for the publishing industry. Paul told us about the motivation behind CQB Publications (UK) Ltd and how an Nwes virtual office via Harlow Enterprise Hub has supported the venture. In the 1990’s, I ran a martial arts group with a friend. He was researching and writing a book about World War 2 organisations such as SOE, the Commandos, the OSS and the Home Guard. Together, we preserved and taught some of the close combat training before he passed away. In January 2006, I was relieved to see the book completed and selling, but very sad that my friend was unable to see his dream realised. What have you learnt from your start-up journey, and what opportunities has it brought you? Although it has been a journey tinged with sadness, the process has been incredible. Teaching yourself the various processes to publish a book is hard going but there is a lot of information and many tools out there to help – and it’s very satisfying when you have mastered some new skills. I’ve not just developed my skillset but launching CQB Publications has also given me the opportunity to visit suppliers and printers across the globe, with a particular highlight being a visit to a print company in North Carolina last year. You currently have an Nwes ‘virtual office’ through the Harlow Enterprise Hub. How has this supported your business? I work from home but I have taken advantage of the virtual business solutions offered by Nwes through Harlow Enterprise Hub. It offers the features of a serviced office space for businesses seeking to raise their professional profile during their growth stages. I’ve been impressed with the support on offer, and as the business grows, I will be looking to take on a unit in the future. What are your plans for the future of CQB Publications? Within two years, I aim to have not only published the final volume of a trilogy, but to have published books by other authors, and develop my services to include proof-reading – a helpful service for authors who self-publish. It’s been an emotional path to establish CQB Publications (UK) Ltd, I am extremely proud of the journey I chose. Having originally started a business to publish just one book, I could never have guessed just how CQB Publications could have developed. Do you have any advice for others who are considering starting their own business? If you have a reasonably good ‘main’ job, don’t let that put you off starting a part-time business. However, I would advise not having the two careers running together for too long. It is possible, but a little risky. You must make a decision when the time is right – and you will know when that is – and take professional advice before you get started.